It has been hard to see how many eggs the Richmond Falcons have. The first egg was laid on March 11th followed by a second on March 13th. Falcons typically have four egg clutches with 24-48 hour intervals in between egg laying. At times it seemed as if the female might be laying another egg – but we have been unable to see into the scrape to confirm any additional eggs. Over the weekend the falcons began to incubate the eggs almost full time which typically begins with the second to last egg. 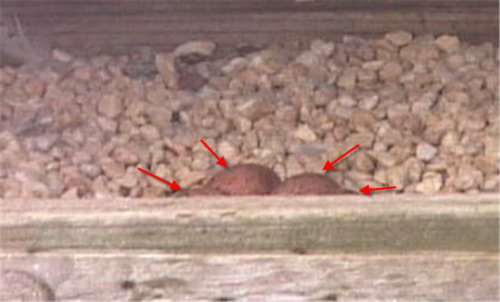 Finally on Tues. March 20th a falcon cam viewer captured an image which shows all four eggs. We continue to try to catch a glimpse of all four eggs, but the falcons are diligently incubating and the eggs typically remain out of view. Falcons incubate their eggs for between 33-35 days. We’ll watch for these eggs to hatch around the third week of April. Due to the constraints of changing technology many viewers had a difficult time viewing the Falcon Cam on Windows Internet Explorer. Our web staff has worked to stabilize the feed and viewers should now be able to see a consistent image.